Well, it’s March 18th, 2014 and I have no doubt in my mind that the last 18 days of life have been the busiest I’ve ever experienced. I have been going non-stop for the past 3 weeks that I’m surprised I’m still conscious. Today has been the first day I’ve been home for a full day since the beginning of March and I’ve got so much catching up to do it’s ridiculous. I know I try to keep this blog as impersonal as I can, but I feel I owe everyone an explanation. At the beginning of March, I was on assignment out of town for my day job, which put me in a hotel for 2 weeks. Without going into too much detail, I work for the largest airline in the world, specifically in operations at my home, but often times I travel to help other airports. I was working at 4am every day for 10-12 hours at a time and it was literally consuming all my time. I tried to post a few updates but it was pretty pathetic. On March 13th I was able to come home for one night, and the next morning I was back on a plane, this time headed to Japan. I had a few photoshoots lined up for a publication I freelance for and had planned to wrap it up in one day (it sounds stupid I know). I arrived in Japan Friday night, and spent the majority of the night sleeping in the back of Sekinei’s van while Matt picked up his R32 at Jet Stroke. We didn’t get to Sekinei’s house until around 1230am, and we had planned on waking up at 4am to get to the first location. I ended up sleeping in of course and we didn’t hit the road until about 5am. We were headed to Shiodome, which is the equivalent of an Italy Town, in Tokyo. We met up with Baki and his friend Kei. Later in the day I had a shoot at Garage G-Force in Yokohama and by that time I was completely burnt out. I was able to take a day off Sunday to spend with a friend in the Chiba area which was nice, but Monday I was back on a plane to the US. I have so much content to share, and so many projects that are site related going on that I feel like I’m not giving the site enough attention. Anyway, I am home (for now), and fully expect to be updating regularly again on top of a few other things. On top of the thousands of photos I have for you, I plan on releasing a series of new canvas prints, new decal designs, a special collaboration with B-Wave and Garage Mak, and if that wasn’t enough I am launching a product line of lightweight carbon products designed for the 96-00 Civic chassis (DOGFIGHT), which if you’ll remember I am building for our NDF Time Attack project. I’ll have much more on our product launch later this week, but I can tell you a lot of time and money has been put into it to ensure a product that can outmatch any on the market. It’s a niche product for sure, but that just means we are able to tailor 100% quality. It’s something I’m really excited for and I hope I can offer something not many others can. Along with this explanation of my absence I wanted to share this shot with you. Before we started the photoshoot Baki wanted to take this style picture with his good friend from college Kei-san. 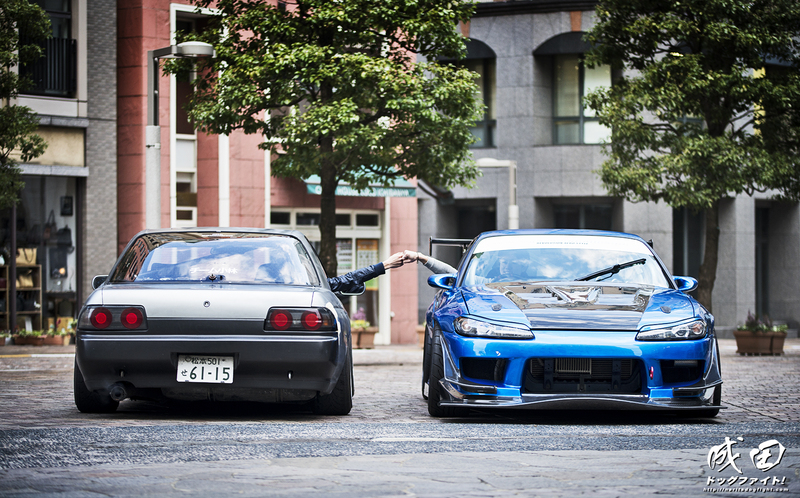 The two cars are completely different in style as Kei street drifts on the regular, and Baki put his heart into building one of the best S15’s in existence with a circuit style in mind, but if you saw these two together they were pretty much the same person. They saw a picture like this somewhere on the internet of two of the Abo-Moon team members doing the same thing and were pretty excited about replicating it. When I told Baki I’d be happy to do it he was really excited. I love connecting with people over something as simple as cars – it really makes what I do worth it, and I’ve said that from the beginning. It’s always about the people. I’ve uploaded these in hi-res, so feel free to use as a background or whatever. Happy to say that Baki will be contributing to the site as well from now on (like Sekinei does), mostly on Garage Mak happenings when he can, but I’m happy to have him on board. He’s really gotten into photography lately and I’m happy to provide an outlet for him. The preceding photoshoot of his S15 went extremely well and while I can’t share any of it with you, I will tell you you’ll definitely want to keep your eye out for the magazine shelves soon. Despite all the things going on, and the lack of site updates, site traffic was still very consistent. That goes to show that the content I post is wanted by many, and for that I am very thankful. Thanks for sticking with me at my busiest!